This blog began as something else. You will still see references through out the posts to a weird Latin term that I really never knew how to say that made reference to my feeling like an outsider in so many religious, political, and philosophical situations. I came to realize that I was not an outsider as much as a middle ground type of person; a moderate voter in a sea of left and right extremes; a pragmatic thinker that sees value in all sides; a progressive church member in a battlefield of evangelical vs. liberal culture wars. What I didn’t realize is that there was a term that described where I resided. Metamodernism is a growing idea that allows for paradox, dialogue, juxtaposition, collaboration, multiple subjectivities, interdisciplinarity, and so on. Looking through the posts that I had made since 2011, I decided in 2015 that I had really been a metamodernist all along. 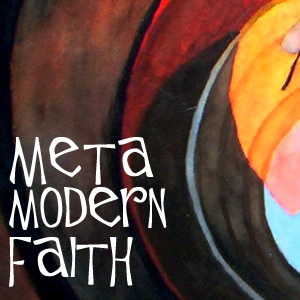 So it was time to actually come up with a name that I could pronounce, as well as an idea that I can connect with: Metamodern Faith. I blog about my day job as a Learning Innovation Coordinator at my EduGeekJournal blog. If you are into Ed Tech or innovations in theory and design of online learning, that is a good blog to follow. This is a blog for my to think through issues of faith, religion, science, politics, and philosophy through the lens of metamodernism. I consider myself a Christian, but many people call me… well, many other terms. I don’t subscribe very well to either fundamentalist or liberal strains of Christianity. For example, I believe that Genesis is to be read literally, but that it still says the Earth is billions of years old. While evangelicals and liberals have a problem with a statement like that, it fits very well within a metamodern mindset. I’m not really an expert on these topics, and so scholarly examination of many of my musings will probably yield less than satisfactory scores. I am still growing, thinking, pondering, considering, and examining these issues from many angles, so all views are subject to change.